China's Foreign Ministry threatens severe repercussions for Canada if CFO Meng Wanzhou remains in custody. The U.S. began a market-shaking case against Huawei Technologies Co. in a Vancouver courtroom, alleging a top executive at the Chinese telecom giant committed fraud to sidestep sanctions against Iran. 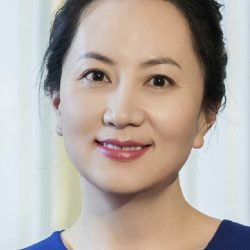 Chief Financial Officer Meng Wanzhou, who was arrested Dec. 1 as she changed planes in Canada, was accused of hiding ties between Huawei and a company called Skycom that did business in Iran, a lawyer representing Canada said during the court hearing Friday. Canada is presenting the case on behalf of the U.S., which wants to extradite Meng. Her arrest has become a flash point in trade tensions between the U.S. and China, roiling markets and provoking outrage from Chinese officials. China’s Foreign Ministry said Saturday it had summoned John McCallum, Canadian ambassador to China, to assist in the immediate release of Meng and threatened severe repercussions for Canada if she remained in custody, according to China Daily. Meng was charged with conspiracy to defraud banks and should not be granted bail because she may flee, Crown attorney John Gibb-Carsley said during the court hearing in Vancouver earlier on Friday. Banks in the U.S. cleared money for Huawei, but unbeknown to these financial firms, they were conducting business with Skycom in contravention of the sanctions, the lawyer said. • During a meeting with HSBC, Meng used PowerPoint slides for a presentation that included several misrepresentations. • She allegedly said Huawei operated in Iran in strict compliance with applicable laws and sanctions, although Skycom was using the U.S. financial system to conduct prohibited Iran transactions. • Meng stated Huawei’s engagement with Skycom was a normal business cooperation, when Skycom was in fact entirely controlled by Huawei.